Considering Harry Potter's fame, did he end up on a Famous Witches and Wizards card, possibly after the Battle of Hogwarts, or even before? Lecanard: Will we see harry and his friends having their own history on chocolate frogs cards J.K. Rowling: Definitely, and Ron will describe this as his finest hour. As a side note, out of canon according to this article there was a Harry Potter card in some video games. Rowling says that Harry, Ron and Hermione were all featured on Chocolate Frog cards (BLC). Trying to find a better source - where she said it. EDIT: See @N_Soong's answer. 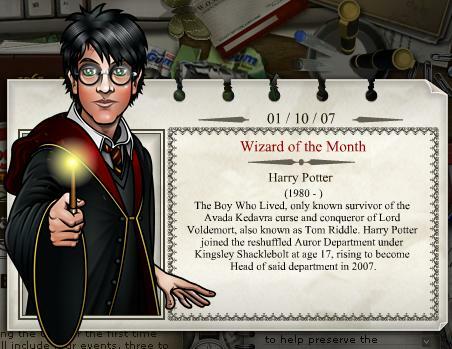 His card also appeared (with more detail) as a Wizard of the Month on the old jkrowling.com. The first and only known wizard to survive the Killing Curse, earning the title "The Boy Who Lived." Youngest Quidditch player in the last century after gaining the spot of Seeker in the Gryffindor Quidditch Team in his first year at Hogwarts in 1991. Also known for having found Salazar Slytherin's Chamber of Secrets and defeating the monster within, which was a basilisk, in his second year at Hogwarts. Known for having once been a Parselmouth. Youngest competitor of the Triwizard Tournament and winner of said Tournament at the age of 14 in 1995. Most famously, for the defeat of the most dangerous dark wizard of all time, Lord Voldemort in 1998 and his work and revolutionisation of the Ministry of Magic. Not the answer you're looking for? Browse other questions tagged harry-potter characters or ask your own question. Which Harry Potter video games have approval and oversight from J.K.Rowling? Which Wizards and Witches used transfiguration magic in battles? Do witches and wizards play vinyl records?